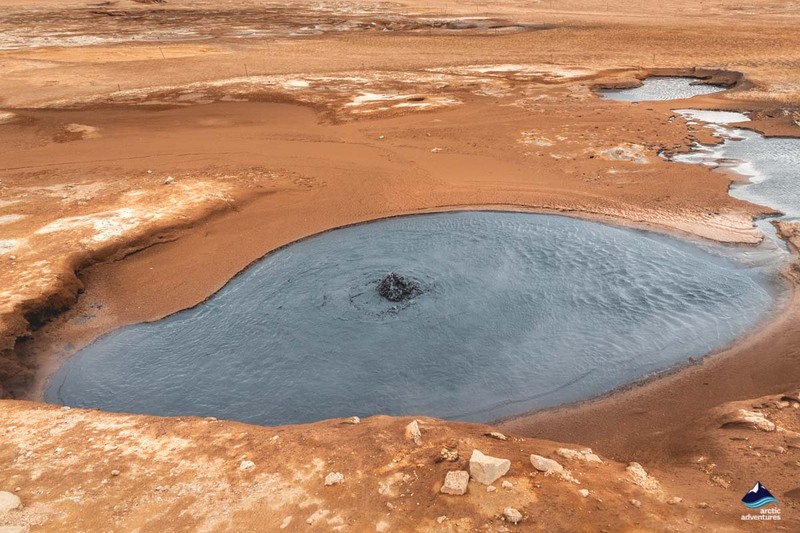 Námaskarð is a true geothermal wonder of hot sulfuric mud springs and steam vents. It’s like a scene from outer space. Natural black rivers and bubbling pools spewing steam and smoke lay in this color-rich mineral landscape that truly takes your breath away! How to get to Namaskard? Námaskarð is a narrow geothermal pass between the mountains Námafjall and Dalfjall in North East Iceland. The Ring Road, or Route 1, takes you directly through Namaskard and past its many curious attractions. 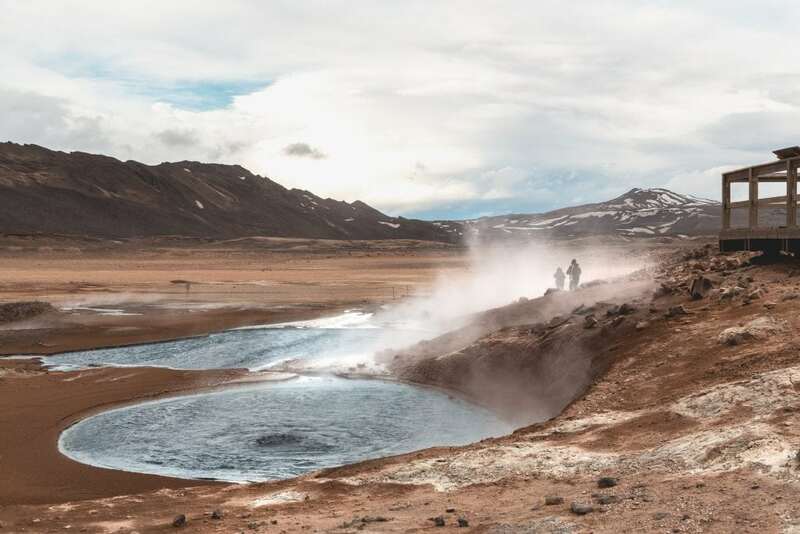 East of Námaskarð you will find Hverarönd, also known as Hverir or “The Geyser Strip,” where fumaroles (steam springs) and mud springs scatter the landscape in a kaleidoscope of colors. 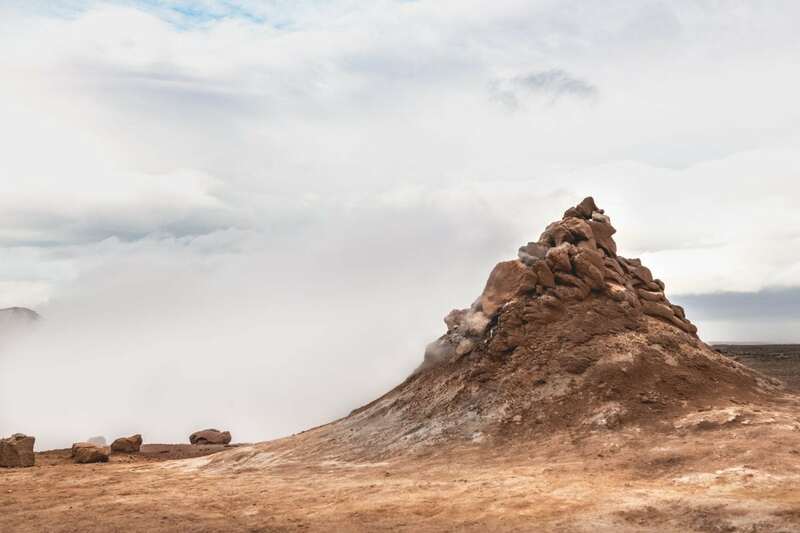 The largest mountain in the area is composed of rhyolite (the same as in Landmannalaugar), which gives the terrain extraordinary colors such as pink, bright yellow, gray-blue and green. You can find these colors in the ground, in the hillsides, and in the mud springs. Everything simmers at boiling point and great caution must be taken when walking around the area. Follow the signs and instructions and keep on the paths. 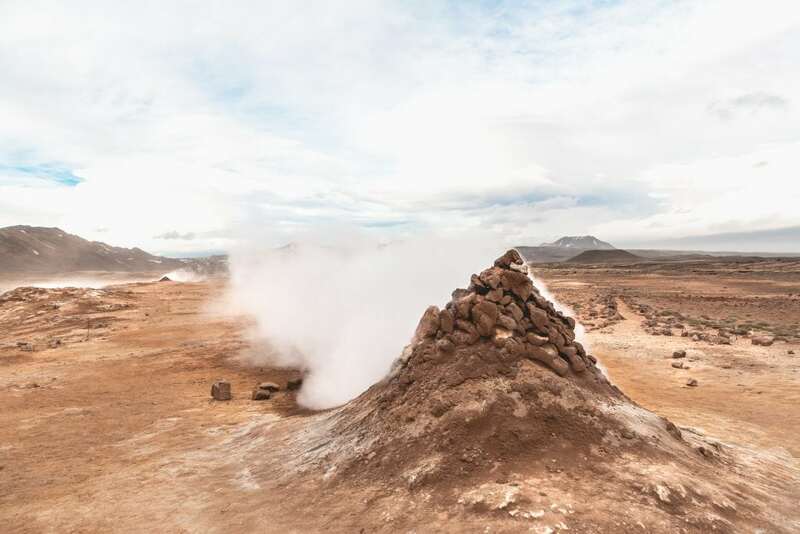 The area isn’t just a modern-day geological wonder, but also historical, as volcanologists have flocked to the geothermal area for centuries. The most recent is the eruption in Krafla caldera, which measures approximately 10 km in diameter with 29 recorded eruptions in history. It’s home to the crater Viti, and several fissure vents that have destroyed a few farms in the area. 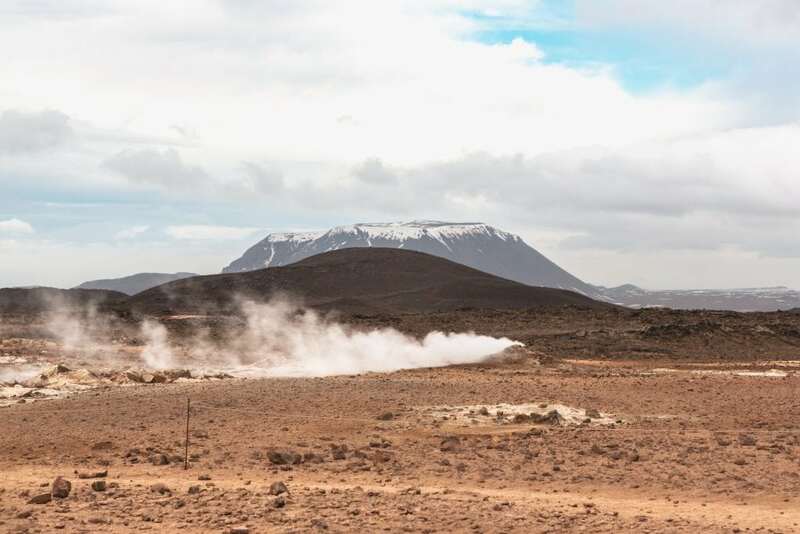 Since 1977, scientists have tapped into the power of Krafla caldera in a nearby 60 MWe power station. 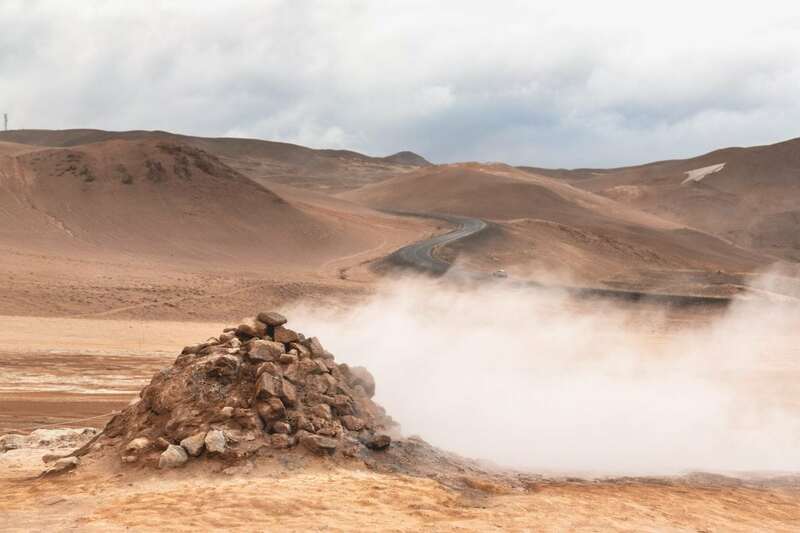 Another element to catch your interest at Namaskard is the sheer lack of vegetation and flora, caused by the high temperatures in the area, unworkable soil and steam that fills the atmosphere. The constant release of volcanic fumes has rendered the ground extremely sterile and acidic, making it unfit for any plant growth. Námafjall is a mountain south of Námaskarð, whose east side is burnt yellow by the geothermal fumes. For centuries, miners retrieved sulfur from the Hlíðarnámar at Námafjall for export. 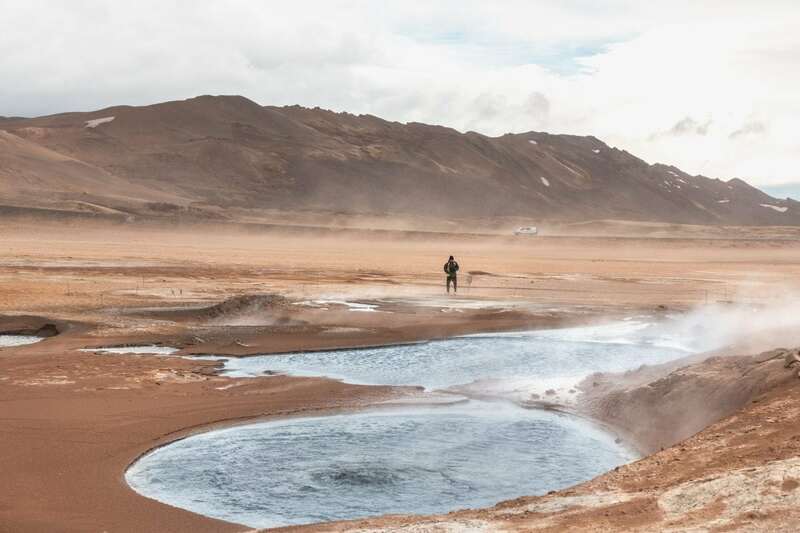 At the foothills of Námsfjall, you’ll find the Hverir Geothermal Area, a strip of hot springs also known as Hverarönd. 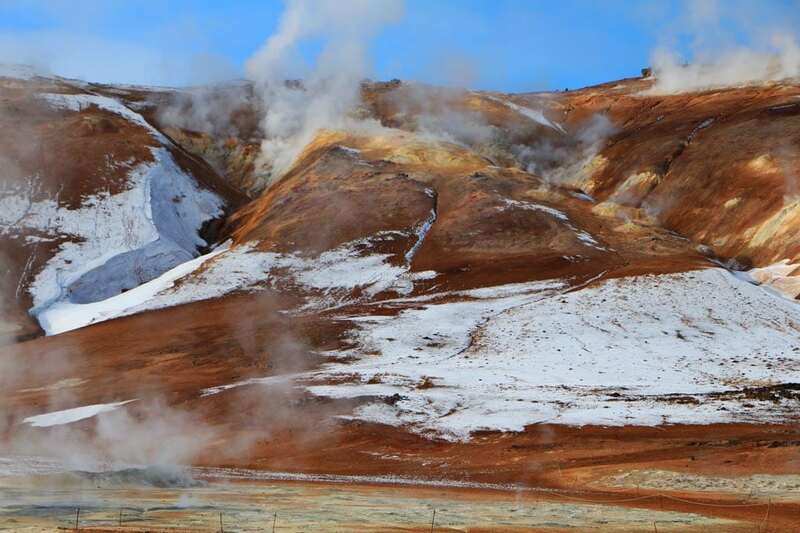 Here you can spy a series of fumaroles, mud pots, and pools that range in color and are ever-changing. Námaskarð is located on the North side of Lake Mývatn about 400 meters (1312 ft) above sea level. It’s around 493 km (306 mi) away from Reykjavík, 105 km (65 mi) from Akureyri and 160 km (99 mi) from Egilsstaðir. Driving the Ring Road 1 in Iceland, you’ll pass through Námakarð so finding the location shouldn’t be too much trouble. As mentioned above, take the Ring Road, the most popular road trip in Iceland. 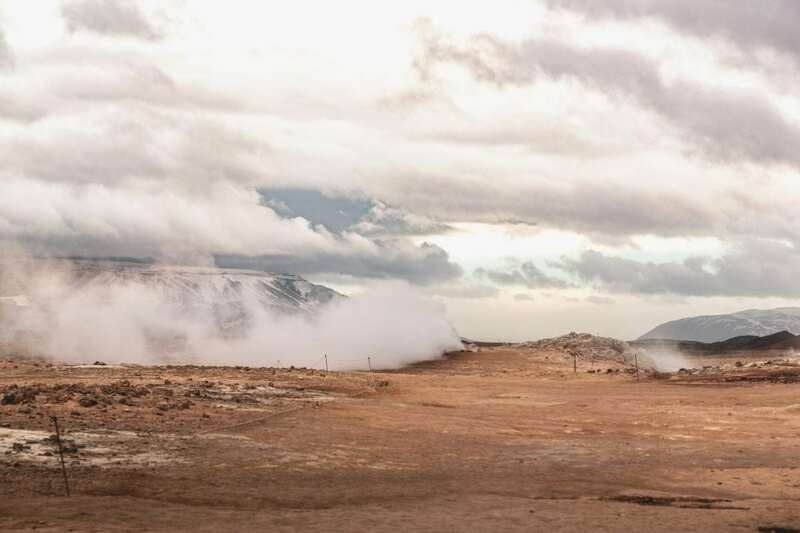 The route cuts right through the Námaskarð Geothermal Pass, so you’re sure not to miss it. If you’re driving the Ring Road clockwise, you’ll likely start in Reykjavík, passing through Borgarfjörður, over the Holtavörðuheiði heath, through Borgarnes and Skagafjörður, past the capital of the North Akureyri and lastly Lake Mývatn before reaching your destination. The drive takes more than 6 hours in one go, but we recommend making many stops along the way. You’ll definitely need a few more days built into your itinerary to explore all that North Iceland can offer. 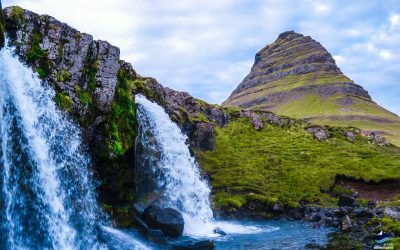 If you’re driving the Ring Road counterclockwise, you’ll likely start in Reykjavík and zoom along the beautiful South Coast, past Seljalandsfoss, Skógafoss, and all the glaciers in the Southeast. You’ll zigzag through the towns of the Eastfjords and then Egilsstaðir, the capital of the East, before reaching Námaskarð. This drive is even longer and would take you approximately 10.5 hours if you do it all in one go. Again, though, we recommend you make plenty of stops along the way! 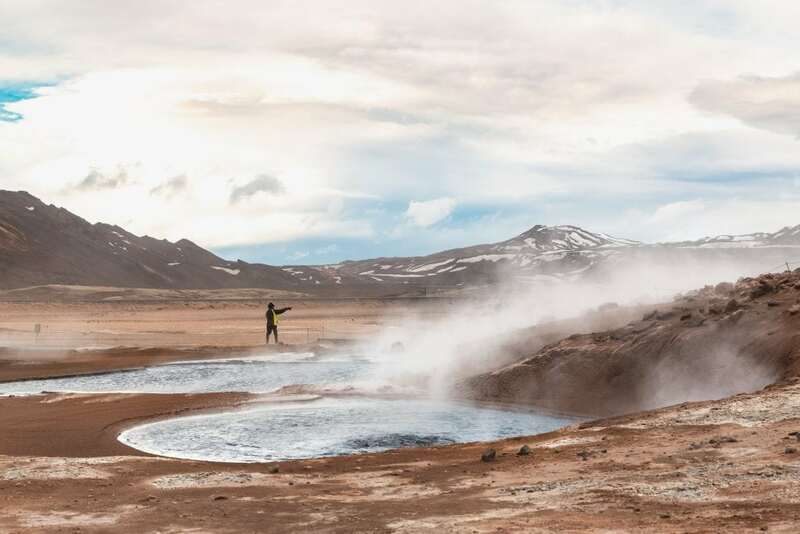 Námskarð is as gorgeous in Winter as it is in Summer, with all the geothermal heat and energy reigning the area it pretty much stays intact with some added snow in the surrounding cold spots and mountains. 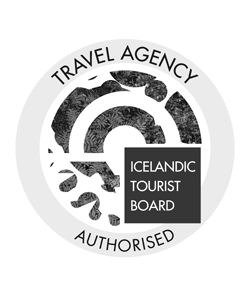 The only challenge that you might have would be getting there, the drive is gorgeous but being so far North and trying to visit such a remote location in the frost and snow Iceland has to offer over the Winter months can be nothing short of hazardous. Make sure you know what you are doing when it comes to driving in these circumstances. Be prepared, dress properly and check the weather and road conditions before going out. 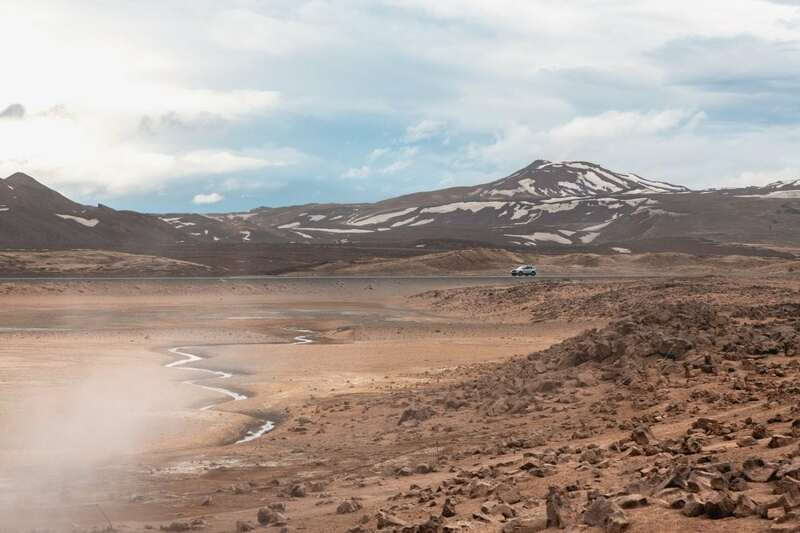 If you’re not ready to drive, Arctic Adventures offers cool tours to this part of Iceland. An expert guide can take you around these places safely. Check them out at the bottom of the page. If you’re visiting Námaskarð, you’ll most likely be driving the Ring Road or touring North Iceland. There are a few experiences in the region not to be missed. If you are visiting Námaskarð without a guide, make sure to read up on the history of the place before you arrive. 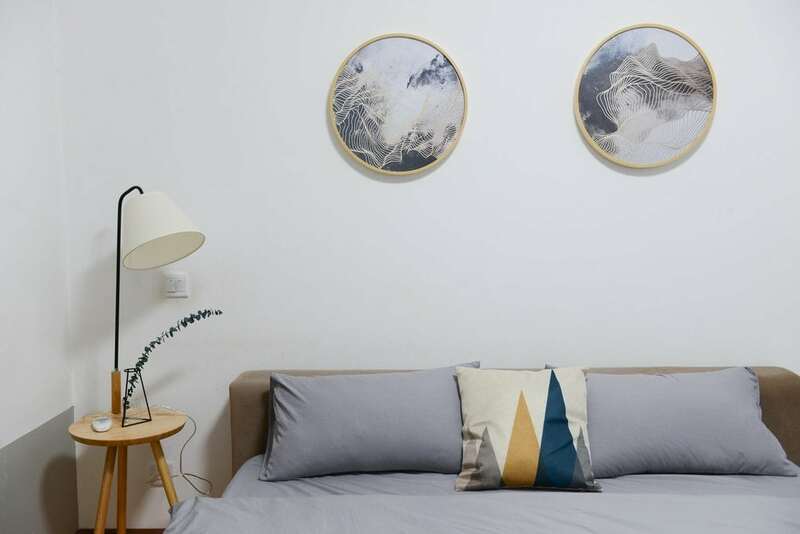 You’ll get a deep knowledge of the area and really appreciate the place. There is so much to learn! Mývatn Nature Baths – The Blue Lagoon of the North – is a popular bathing spot only a few minutes away, to visit Námaskarð without a dip in the turquoise blue waters would be an unfulfilled trip. Get the best of both worlds on the geothermal scale! Hverfjall is an extraordinary place to explore and should surely be on the list. This place is without a doubt one of the most moon-like vistas you will encounter in Iceland and will take your imagination into space. 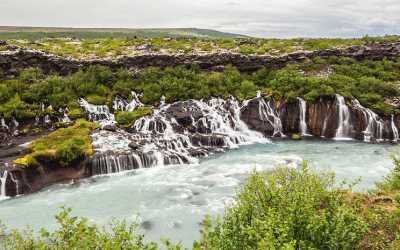 Dettifoss, Selfoss and Goðafoss: The Three Musketeers, the water wonders of North Iceland. You simply can’t miss them. 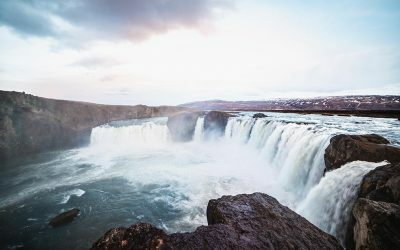 Once you are at Dettifoss it is only a few minutes walk down to Selfoss and Goðafoss, well you simply can’t skip the Waterfall of the Gods, can you? Dimmuborgir Lava Park: Iceland might not be a place of many trees but finding lava is never a challenge! 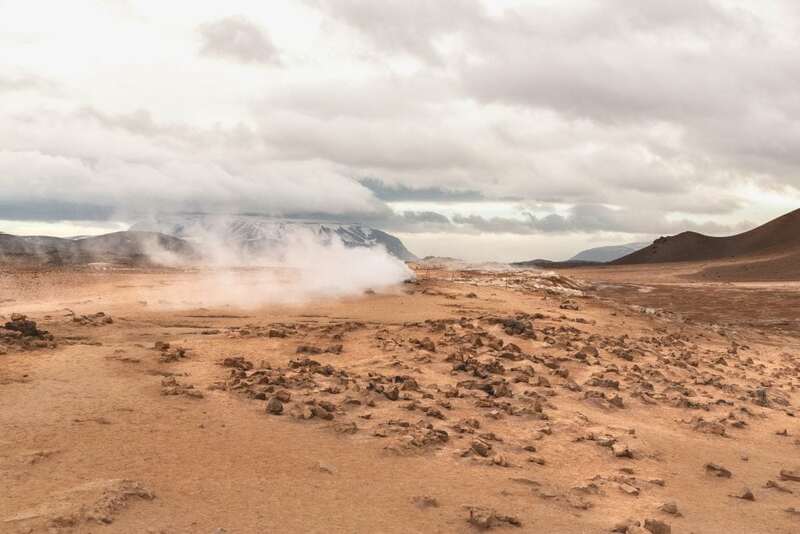 Still, this enchanting park of curious lava formations will amaze anyone who visits! 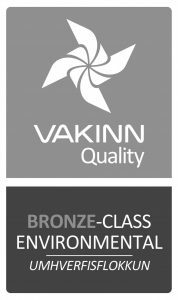 It’s located right next to Lake Myvatn and Mt. Hverfjall so you won’t have to drive far. The lava field and all of the rock formations naturally created by lava flow and volcanic eruptions in the area over the centuries are surely worth the visit. There are great walking paths and plenty of ways to go around the park and well worth the visit. If you are driving around the area, park somewhere safe and walk around on the trails. This area has the most unique and incredible landscape and you are going to want to cherish it! 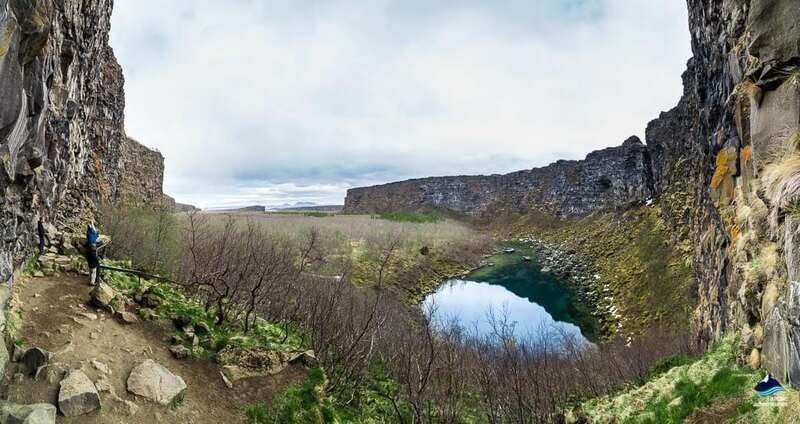 Ásbyrgi, one of the stops on the Diamond Circle and one of the many magical features found in the Vatnajökull National Park. This horseshoe-shaped, 3,5 km long and 1 km wide wonderment is a glacial canyon which offers you jaw-dropping views and spectacular sights as you roam around. Many Icelanders refer to this place as a paradise especially due to its birch flora and dark blue ponds. 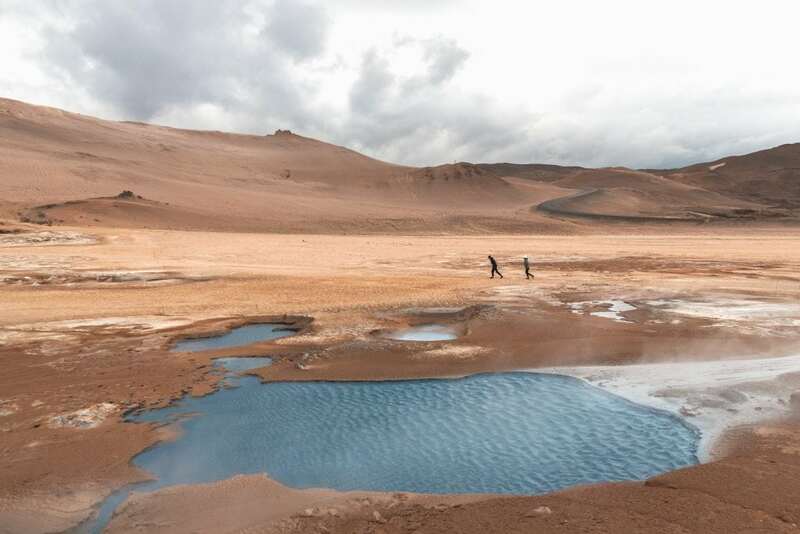 A true oasis in the middle of a volcanic zone! 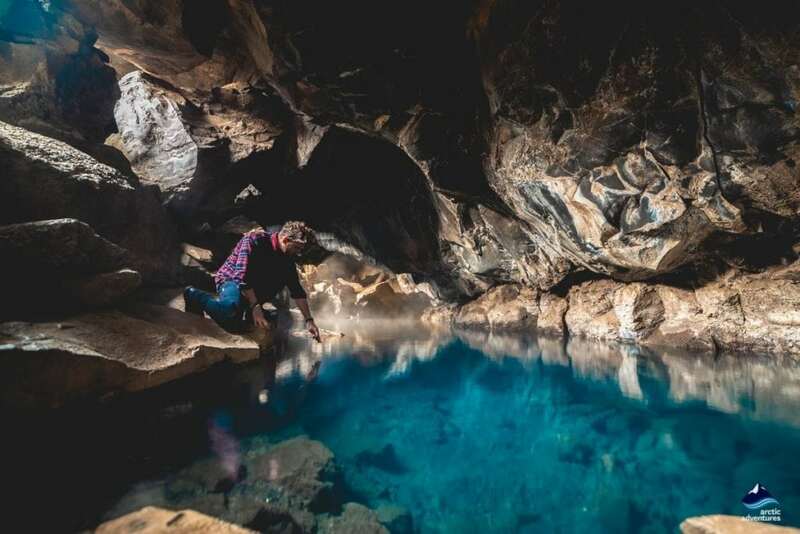 Grjotagja Cave is a famous lava cave with a thermal spring. It’s easily reached from the road and is known for its rich colors. In the 18th century, outlaw Jón Markússon lived here. More recently, it was featured in the hit HBO show Games of Thrones. 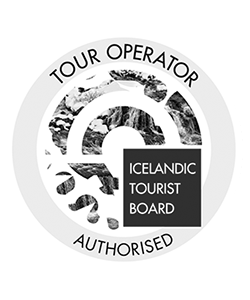 Join us for this extraordinary tour and experience the unmatched North Icelandic ambiance! 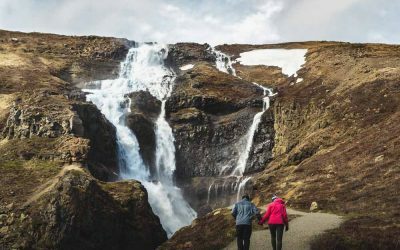 The Must-Dos and the Hidden Gems, make the most of your 8 Days in Iceland tour with an expert guide and group of like-minded travelers. 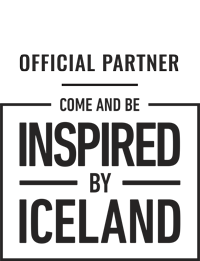 This is your chance to view Iceland the right way!